Awesome Toast! 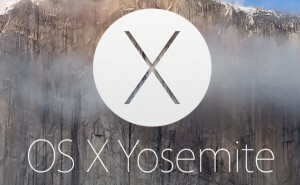 | OS X Yosemite, Core Storage, and partition woes OS X Yosemite, Core Storage, and partition woes – Awesome Toast! Did not work for me, it was revertible. Ran the above command line and selecting Macintosh HD shows “you may only merge this partition with the one before it. To do this, click -” The Yosemite partition shows it can be deleted. 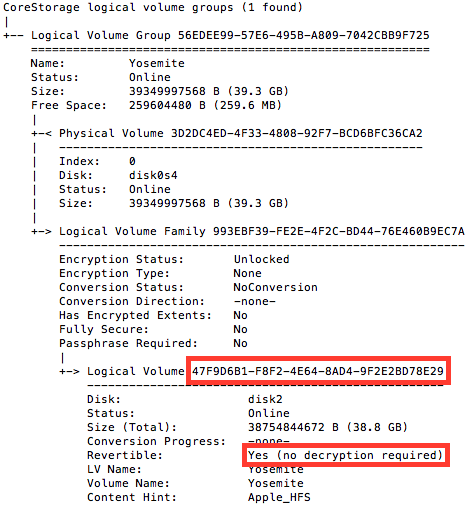 The structure now is Yosemite HD “core storage logical volume. Under that Yosemite HD as the startup disk, Macintosh HD as a mounted partition and greyed out Yosemite HD as an unmounted partition. Any ideas? Why do I now have the third greyed out Yosemite HD unmounted partition? So your Yosemite partition is the SECOND one, correct? In that case (sigh), what I had to do was clone the 2nd partition to the 1st, then delete the 2nd and expand the 1st to fill the whole drive. Talk about convolution. But it worked. In Disk Utility, you do this by selecting a partition, clicking the Restore tab (on the right, or main panel), then you drag the source and destination partitions to the right places. For 320 GB, this took about 2 hours. Hi Aaron, I also worked that out and yes astoundingly convoluted, but it worked. Yosemite was the second partition and could only be “shrunk” The first partition could also be shrunk, but the space via Disk Utility is not available to the second partition. In disk utility I tried to restore from the second to the (now erased) first partition, but it said it could not be restored and to restart in repair mode. So I restarted with the Option key held, then ended up in disk utility, then was able to restore from the second to first partition. Source was the second and dragged the first from top left to the destination. 3 hours on a 2011 MBP for about 230GB. Then erased the second partition and dragged the first to get back all the disk space. In hindsight (wonderful thing) due to really liking Yosemite and the way the MBP ran compared to Mavericks installed over Mountain Lion, I would do a Time Machine backup, create a USB bootable drive and clean install that way. I may even do that to go back to core storage, as Apple intended, but do not know why there was a change or if it makes a difference to performance. I meant recovery mode. There were two Yosemite recovery options, so I used the one on the far right presuming that would be the second partition. Afterwards, do we then need to revert back to coreStorage? No need to revert. Fortunately. This process will need to be repeated after every Yosemite upgrade? Only when installing Yosemite to a secondary partition on the drive, and then wanting to make it the primary partition. Had I, for example, just upgraded from Mavericks to Yosemite (a.k.a. the normal way) without any of these partition shenanigans, none of this would be necessary. There are reasons to do different partitions, but the point is, no. This will not be necessary all the time. Disk Warrior can no longer be booted from the DVD unless the Core Storage is destroyed. This command — diskutil cs revert disk1 — reverts the primary drive to “normal.” I’ve never experienced any of the issues that Core Storage is supposed to prevent, so right now this upgrade has created more issues than it has solved. I don’t really have experience with terminal, but I think in my case the yosemite HD is the first one. I can see the name is Yosemite HD, and it has 50 GB, and the other is 198 GB. If this is correct, it says that it is not revertible. What can I do now? Thank you so much! Worked perfectly. Had to make sure to shut down terminal as well as disk utility before being able to erase the partition, but that was the only thing I stumbled on. Much appreciated! IT WORKED FOR ME… THANK GOD. sorry for caps but, i was getting really annoyed. Excellent write up and instructions, i can’t thank you enough. This worked perfectly for me. I had setup a partition to test the beta version of Yosemite and needed to revert back to a single partition. I was working on a computer that was new and I didn’t have anything that needed to be preserved though. So I didn’t care if it erased the entire drive. I was able to repartition after running this terminal command. Thanks for sharing this solution! I did it, then restart, and so my OSX partition can be drag to resize it. so i tried this, i’ve reverted everything successfully, but i still cant get my disk to take up almost like 300 GB of free space, its still grayed out. its not telling me anything, and im about to do the restarty thing to get into disk utility that way, but i figured i’d post a screenshot first and hope it works, if you’re wondering why i have a partition thats less than half the size of the total disk space, i have no clue, when a friend gave me this he explained it as a “OS change fail”, almost a whole year ago. Halefrickinluja! You ended my nightmare! I am getting similar issue to graham, no corestorage logical volume groups found. Have never had filevault on though so had no need to turn that off, never been able to resize macintosh hd yosemite partition to smaller size. Do have bootcamp partition though and wonder if Graham also had this. Thank you very much for this post, I’ve been scratching my head for a couple of days now, with a lot of destructive solutions proposed to getting the file system back the way it was. I was very close to re-installing OSX when I found this. How is anyone supposed to know that this is what a Yosemite “upgrade” does? I feel betrayed…. Why do I need virtual volumes when I have less than 4 partitions? Other OSes play much nicer than this in my opinion. Would’ve been nice to know what was going on beforehand before I lost work time trying to figure out what was going on. I seriously love you. Thank you!! It’s not in the man page for diskutil, but ‘diskutil cs resizevolume’ is available to resize core storage LV’s directly. It’ll work on encrypted volumes as well. Saved me a lot of time from backing up, completely reformatting the drive and restoring the backup. This worked perfectly! Thank you!!!!!!!!!!!!!! No CoreStorage logical volume groups found” Help? Thank you, thank you, thank you very much! I was that close to return my new MacBookPro I bought yesterday. I am not sure I am out of the woods yet. I need total of 3 partitions. One for Windows and one for data used by Windows and Mac. I have to have that because I have a Linux VM in Windows. I have not sleep for 36 hours trying to port my older MBP15 to this new machine and stuck with the partitioning nightware. Just GREAT. Worked immmediately, got my free space back. THANKS!!! Thank you very much! 🙂 this is awesome appreciated! Did you have PGP installed on your drive first before running the command? Any idea WTF this means and the workround? Thanks, you save my day! This walkthrough worked like a charm and saved me a bunch of time. Glad Google has placed you at the top of the search list for “yosemite resize partition”. Much thanks! Worked for me! Was able to create new partition to install Mavericks on it! any way to burn a Mac yasomite iso to flash and reinstall Mac without destructive methods? OMG It worked like a charm. Thanks sooo much for putting up this post. I also have “Paragon HFS+ for Windows10” on Windows 8.1 Bootcamp, still can’t see the Mac partition. But I can see windows partition ONLY after installing Paragon NTFS for Mac 12. I upgraded to Yosemite from Mavericks. Here is my disk run. As you can see says: Revertible: no. Thanks from Spain! Very easy one time i put commands! Aaron, thanks a 1000 times!!! I have the same issue as daveb, (#46, three quotes above) — I also have “Revertible: No” as the current status. Any way to get this fixed/changed? This is a 27″ iMac / Late 2012, with a Fusion drive. No BootCamp and no Paragon software. Thanks! It worked perfectly. I used it so as to be able to rely on Clonezilla again for preparing MacBooks. Bro, thank you very very much!!!!!! Hi and first thank you! I’m trying to install Windows XP on Yosemite and the only remaining obstacle left is that I can’t see the new partition (prepped, formatted Windows NT) in a alt or option restart. I can see it in disk utility *from the desktop*. I was wondering if you think that this fix could work in my case as well? I’m not very savvy so your tutorial will be the hardest yet but if I formatted a HD in Yosemite for windows wo Bootcamp I must be learning! Lol thank you!! Am I really out of luck if the diskutil cs list command indicates “no” for “revertible?” Is there no way around this? I have the same issue as Jordan comment #56. I followed the advice of an “expert” and formatted two 3TB drives simultaneously, and both of them says they’re not revertable. I can use the somewhat undocumented coreStorage commands in terminal to delete the volumes, but nothing on the actual Logical Partition Group. Thanks a trillion times, I was beginning to lose my mind until I did this…u rock! THANK YOU!!! This fixed my Clonezilla issue with Yosemite!!! Been searching and searching but this article solved my problem!! Thank you so much!!!! Thanks a lot! It worked perfectly. I just used this little trick to erase a TimeMachine ptiritaon that wouldn’t accept the encryption password anymore. Yes, I had the right password, had used it before and stored it in KeyChain and 1Password. The other (non-encrypted) ptiritaon on the same physical disk was left untouched and unharmed. The only damage seems to be the loss of my TimeMachine backups, a lesser problem since I have multiple non-TM backups as well.What is the point of FileVaulting your startup disk if the backup is NOT encrypted as well?Now, why should this happen in the first place?So, a million thanks to people smarter and more knowledgeable than myself! Now what is the command i have to use to revert back to coreStorage? I want to reinstall the OS using recovery tools, but now the disk cannot be selected to do so. This worked perfectly for a client’s machine – thanks for the post!